Our Conservation & Environment Project in Mexico is a unique placement that offers you the chance to work alongside local experts on a variety of conservation and environmental projects. You can get involved in working with sea turtles, help to protect their nests and eggs, and contribute directly to the conservation of these increasingly endangered creatures. Volunteers also have the opportunity to work closely with crocodiles and iguanas, and participate in important biodiversity studies whose data is used by researchers across the Americas. This project would be ideal for anyone with an interest in nature and adventure. You will get to perform real hands-on work and learn about some fascinating wildlife, all the while making a positive impact in the field of conservation. You do not need previous experience to take part in this project. 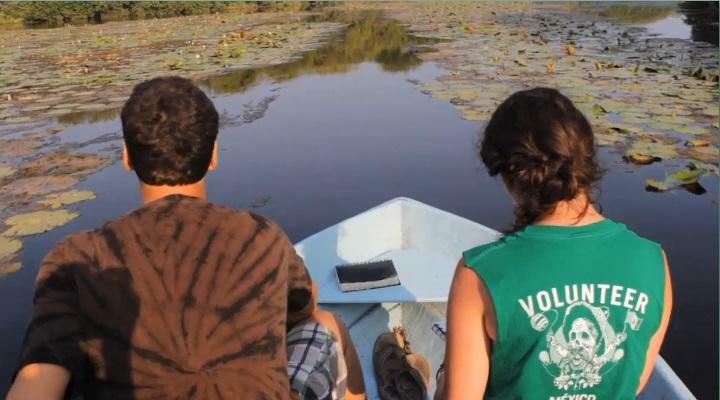 Volunteers are welcome on a gap year, a career break, for university research, or as part of a summer holiday. Turtle conservation: The turtle conservation project is based at the El Tortugario Centro Ecológico de Cuyutlan, located next to a lagoon where biodiversity studies are conducted. Volunteers will take part in night patrols along a 30 km stretch of beach to identify new turtle nests, collect sea turtle eggs in order to relocate them to a safe place, and keep an eye out for poaching activity. You will also collect information about the in situ or poached nests for research and statistical purposes. Volunteers will monitor the nests where the relocated eggs have been placed, and once the baby turtles have hatched, help clean the nests and release the hatchlings into the sea. Other duties include the cleaning of adult and hatchling sea turtle tanks, the cleaning of adult turtles and generally looking after their well-being - ensuring that they are well fed, unstressed, uninjured and measured and weighed once a month. Assisting at a crocodile park: Volunteers will visit La Colorada Crocodile Center, in Cofradia de Morelos, once a week, and help to clean and maintain the pens, and the centre’s facilities. You will also be involved in taking biometric data and marking the crocodiles in nearby lagoons. Caring for iguanas: Volunteers will help to feed baby and adult green iguanas, and maintain their enclosures. Biodiversity studies: You will be required to monitor the presence and condition of wildlife in the Palo Verde estuary and El Chupadero lagoon, and maintain a register through direct observation and trap cameras for night surveillance. Volunteers will also monitor and collect data on the state of nearby mangrove forests, help grow mangrove seedlings in a greenhouse, and reforest areas where the mangrove forest has been damaged or removed. The aims and objectives of this project involve the conservation and reintroduction of various species of wildlife. We are also involved in biodiversity studies. Conservation sites in Mexico are protected by SEMARNAT (The Department of Environmental Affairs and Natural Resources). In recognition of our commitment to conservation we have been entrusted to manage a section of coastline stretching 24km. You can read more detailed information about the aims of the project in our Mexico Conservation Management Plan. Volunteers will be accommodated in a shared house close to both the town centre and the beach. Interestingly enough, the beach has black sand due to volcanic activity. The accomodation is situated about 1 km from the turtle conservation centre, making for an easy commute to work, and is also a few kilometres away from a small resort town. In your time off, you will have a chance to experience all that Mexico has to offer. The house has several single and shared bedrooms, as well as a communal kitchen and a swimming pool. You will be required to help with some basic maintenance and cleaning at the house. You can join the Conservation & Environment project in Mexico for one, two or three weeks if you don't have time to join us for four weeks or more. This project has been selected by our local colleagues as being suitable for short term volunteering for both the host community and the volunteer. Although you will gain a valuable cultural insight and work intensely on a variety of conservation activities please be aware that you may not be able to make the same impact as someone volunteering for a longer period. Volunteers joining the Conservation & Environment project for just one week should arrive at a weekend.